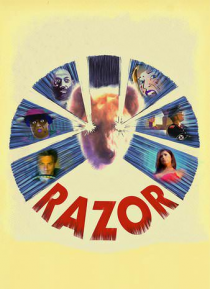 Written and Directed by James P. Lay...RAZOR is a very quirky original film, a sarcastic, absurdist comedy film starring Sid Haig (of Rob Zombie's DEVIL'S REJECTS). RAZOR is shot in a live action/comic book format like the Spiderman films. The storyline utilizes a hypocrisy-sniffing Hyena named Razor who its owners, a hybrid religious cult called the "Puritans" (something of a mixture of Scientolo… gy and the Amish) believe Razor is a gift from God who tells them who is good and bad.